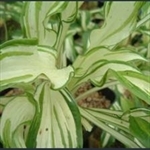 Hostas are normally grown for their foliage, and cultivars have been produced with an astonishing variety of leaf shape, colour and size. Most of broad, rounded leaves with a pointed tip, and these may be blue-grey, green, yellow or cream, and striped in any number of ways with any of the other colours. Most have leaves 20 to30 cm long, but there are lovely miniatures, and a few bigger ones. Relatively tall stems carry the tubular flowers, which are almost invariably white or pale purply blue, and rarely add much to the attractiveness of the plants. In autumn they die down, so the leaves are easily cleared away, ready to emerge in spring. Hosta with heart-shaped, bright grey-blue leaves. Mid green leaves with broad margins of creamy white. Cream-coloured leaves with irregular green margins, bearing lilac flowers. Compact variety with, thin ripple-edged cream and green leaves; purple flowers. Lime green leaves edged with darker green; dwarf.